You'll be £11.99 closer to your next £10.00 credit when you purchase Storm from the Sea. What's this? This classic account is a dynamic and vivid record of what it was like to fight with Britain's Commandos across wartime. Peter Young, who joined 3 Commando in June 1940 and went into action with them in July of that year, sets down a spirited tale of adventure, heroism and ever-present danger in this valuable narrative of an elite force at war. 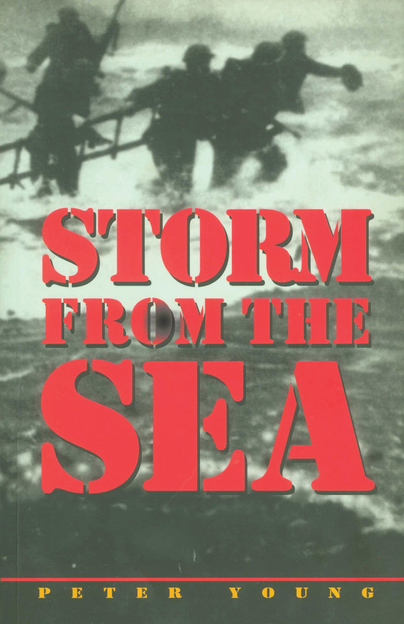 Storm from the Sea is the commandos' story of war and describes a number of key Commando raids against targets in occupied Europe. The first amphibious operation of note was against the Lofoten islands and a second raid against Vaagso quickly followed. Despite a setback at Dieppe, the commandos continued to annoy the Germans with hit and run attacks and Peter Young's men participated in the invasion of Sicily and in operations in Italy until being recalled for D-Day. Hard fighting in Normandy followed and the author recalls the daily skirmishes and ambushes which, for the commandos, so typified the liberation of France. After a brief period attached to 3rd Commando Brigade in Burma, Peter Young ended his war preparing for operations in Malaya. The conflict had been a punishing adventure but, as he testifies in Storm from the Sea, his Army Commandos came through with a tremendous reputation for daring and stealth.